It's Blood Orange Season. I scored a bag at Walmart. I know. Big bad box store. Honestly, if you think that the only place you should shop is Whole Foods, you need to realize that most of America is still small towns. Small towns usually only have a Walmart...even smaller towns don't even have one. Of course I'm thinking of Junction, Texas, where I went to graduate school. There was one stop light in town, the local grocery store was Super S Foods. The closest Walmart is 50 miles away. I like to think that anyone who wants to try to eat clean, eat paleo, or dip into the Whole30 has a chance, even when you are in a small town. So I shop at Walmart to know what the possibilities and challenges are for eating healthy. Another great option for getting your clean eating products is Thrive Market. I love Thrive. They have some of the best prices out there, and they sponsor free memberships to low-income American families. They are committed to sustainability and social justice projects. The part of me that earned my Master's of Art Education is jumping for joy at the social justice aspect. This made 28-30 oz of pudding so I filled up two wide mouth 16 oz Mason Jars. You could split it into four servings easily. If your pairing knife isn't sharp do yourself a favor and sharpen it quickly. Using your chef's knife cut the oranges into quarters, and then cut each quarter in half. You should end up with 8 pieces per orange x 4 oranges = 32 pieces. Remove any seeds you spy and discard while slicing. Here I am slicing regular oranges using the same technique. Press down and through to the other side away from your hand. Now for the fun part. If you are like me and have trouble standing, bring the oranges, cutting board, blender, and pairing knife to your table and sit down. 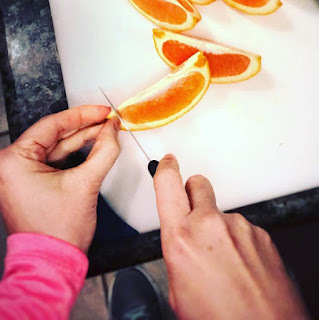 Take a slice of orange and hold down one of the tipped edges with of your finger. 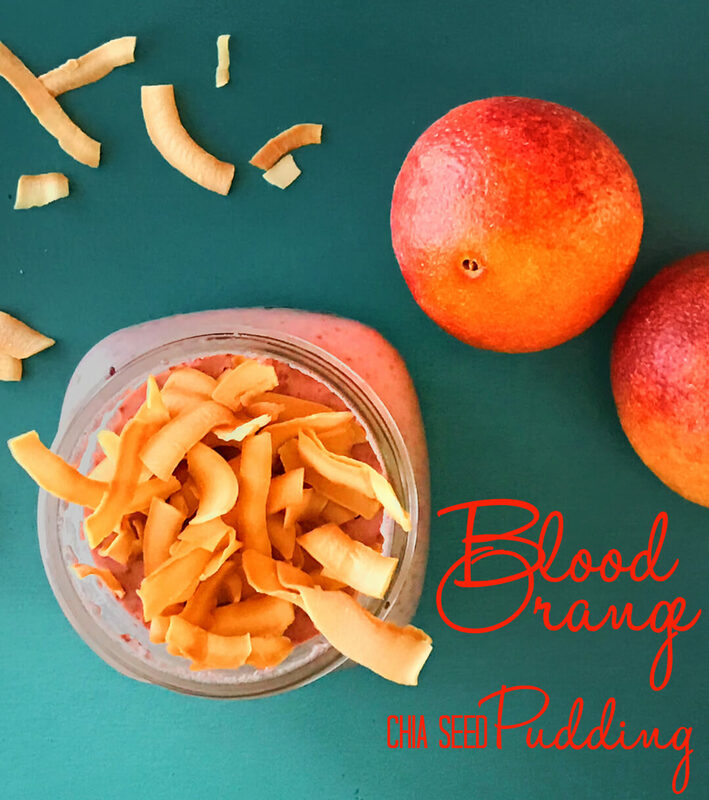 Now take your pairing knife and cut in between the pith and the fruit slightly to get it started. Then pressing down firmly, slide the knife across the orange AWAY from your hand in one smooth motion. This is why you want a very sharp pairing knife. It should easily separate the fruit from the peel. Drop the orange in the blender and discard the peel. Don't obsess about getting everything off the peel, life it too short and you'll go crazy. Finish off the rest of the oranges dumping all of them in the blender, throw away the peel or compost them if you are into that sort of thing. Now shake the can of coconut milk. Open and dump into blender. Measure out your honey. PRO TIP: Spray your 1/4 measuring cup with your olive spray, or coat with coconut oil, to make the honey come out easier, it will not alter the taste of what you are making. Add vanilla to the blender, cover and blend. After fruit has been thoroughly blended and mixed, stop the blender and add the chia seeds. Turn the blender on a few moments to mix the chia seeds in. Pour into your containers. Cover and chill overnight or at least 8 hours for the seeds to develop fully. I topped mine with Dang Gluten Free Toasted Coconut Chips, Caramel Sea Salt for a little extra crunch and kick! They were a super yummy addition. Done! Now go Treat Yo Self! No one likes them and no one wants them. Sometimes you can distract yourself, sometimes you are just in survival mode until it passes. 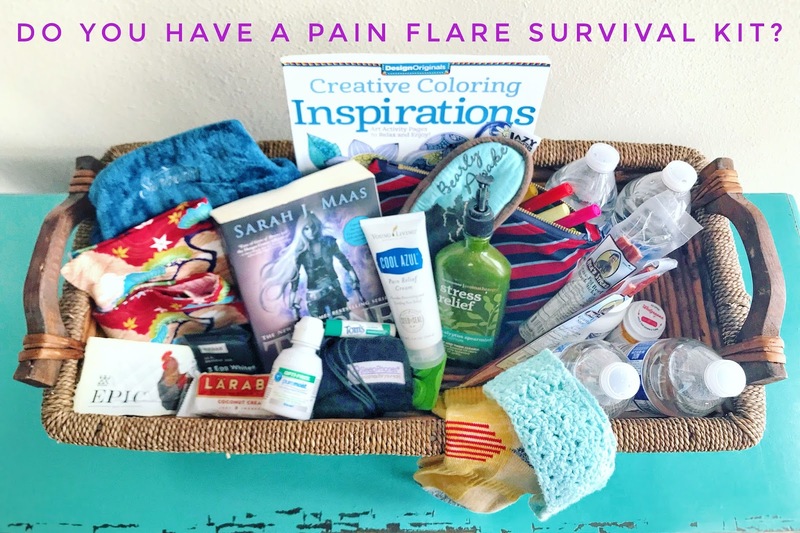 Chronic Pain and Illness Flare Ups: You Need a Survival Kit! 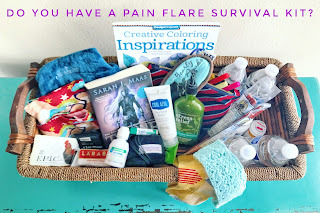 I have a pain flare box. It's my survival kit. I have it stocked with items to distract me, help me, and comfort me. It's located right next to the downstairs sofa for convenience. I have to pass by the fridge to get to it, so I pick up my gel ice packs on the way. So what's in my kit? If you don't have kids or pets that would get into it, I recommend getting a small pill pack and putting a few of your medicines in each slot. If you haven't noticed, I'm a bit of a Paleo and Whole30 freakazoid. I have Nick's Sticks, Larabars, Epic Bars, and RX bars in my kit so I can stay true to my healthy eating. I'm working on a Paleo 'Saltine' recipe when it is ready, I will let you know. If I didn't have an apple obsessed golden retriever, those would be in there too. Helps heal ulcers and leaky gut by acting as a Band-Aid for protection from further damage. Is an essential neurotransmitter in the brain and decreases muscle wasting. Hydrate! Hydrate! Hydrate! I cannot stress enough the importance of drinking water during a pain flare. You need to get your cells moving and flush your body. Sleeping masks are amazing. 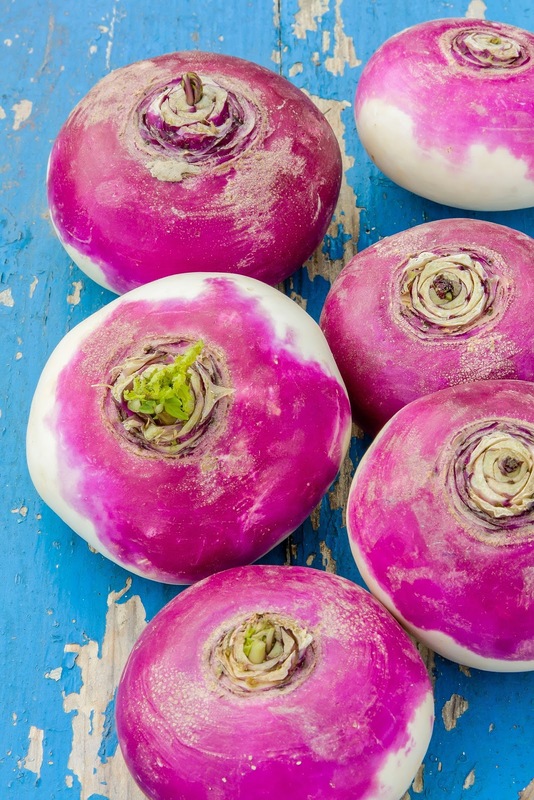 It really shuts out the light, letting your body's natural melatonin work. Also helps to make it easier to take a nap during day time. There are several kinds out there but this is the highest rated one on Amazon so it must be good. It comes in a three pack. Keep one in the bedroom and one by the couch. Last one is clean so you can rotate them in and out. I know that this seems counter-intuitive since I said I was getting ice packs on the way to my couch. Well, my nerve pain extends from my lumbar spine to my hip and down my legs. However, during a flare I tense up, usually leaving me with a tension headache after the pain flare has left. I wrap this little beauty nice and snug around my neck and shoulders. Plus, during the winter, it is not super pleasant to have ice packs shoved down your pants. My go to pair died I wore them so much, they were a spa aloe Dr. Scholl's sock. Soft and warm, I swear angels made these. I couldn't find the aloe ones but did find this shea butter pair. Sounds like a little slice of heaven in a pain filled day. I can't wait to get a new pair. Sometimes coloring is nice if I can really get into it. I have a lapdesk stashed under the couch. I recently got into a motivational sayings coloring book. I'm switching it up from my Harry Potter one. To each his own. There are some marvelous books out there from Game of Thrones to Swear Words. SleepPhones you can truly, actually sleep in. I love these. Flat speakers inside a soft, fleece headband. YAAAAS! Right now I'm super into the Throne of Glass Series by Sarah J. Maas. There are several books in the series. #leohusband got the first book for me Christmas 2016 and I've been hooked ever since. I feel like I would describe them as Assassins Creed meets Harry Potter meets Game of Thones. I made this myself and I will be putting up directions, as one of my weekend warrior projects, and links to get one if you are not down with the skills of sewing. I love it. It fits the Large Ace Bandage Gel Ice Pack and ties to anywhere on your body. Sometimes you just want your hair out of your face. I did cut all my hair off once I realized that my nerve pain was going to be permanent. It is a long pixie though, so I still feel the need sometimes to get it off my forehead. Young Living's Cool Azul is my hands down go to. I rub it directly on the area of pain. I can't ever have heat on my nerve pain. It makes the neuro-inflammation so much worse. Cool Azul is the only rub I've used that doesn't heat up after cooling. It stays cool. I love that. I just find that peppermint really helps to calm nausea down. I also know that medicines can really dry your skin out (again, hydrate!) so I like to keep my lips from cracking. You want to put the most delicious smelling lotion you have ever breathed in your survival kit. Smell plays a huge part in your brain receptors. Get something that will make you relax and hopefully soothe you. Why not perfume or essential oils? Perfume has alcohols in them, not to mention they can be overpowering and will contribute to drying out your skin, again, it's a side effect of a medication. Even though I love them, essential oils always stand a chance of irritating your skin, or worse, your eyes. Trust me, the last thing you want to do is rub your rollerball essential oil blend on your temples and it gets in your eye. Now you're in pain and your eye is stinging like crazy. Not that I've done that. I really got into a collagen and matcha afternoon pick me up without the harshness of coffee. I know everyone faces tiredness at about the mid-afternoon point. Sometimes when you do have a chronic condition, that old mid-afternoon slump turns you used to have, turns into a dead bone feeling of tiredness you just can't head bob your way out of. If you haven't tried Thrive Market yet, that is where I get the culinary matcha used to whip up this drink. It's amazing and I love it. Thrive is great is you live in a small town (or even a big one) because they offer amazing prices. That is so beneficial to me as most of our income goes to my medical expenses. Plus, not everyone has a Whole Foods Market near them. As I am mostly paleo, I put in a teaspoon of honey along with a tablespoon of full fat coconut milk, a scoop of collagen, and 1 teaspoon of matcha powder with about 8-12 ounces of Zico coconut water. All of which you can get on Thrive or Amazon. Blend with your blending stick or blender and enjoy. We went crazy and decided to try one of those subscription meal delivery services. I was stuck in a rut of doing the same Paleo and Whole 30 meals back to back, and up and over and under! I looked at all of them, because there are a lot of services out there. I had specific criteria...had to have organic options, had to be Paleo compliant, or at least enough where I could add a few things of my own to make it that way. Lo and behold...there is only one company out there (hopefully more will come soon) that met my criteria. Sun Basket. It offers Paleo and Whole30 compliant meals. They also use organic ingredients which makes my Regenerative Medicine doctor do a happy dance. I really hit my stride and went full force into bullet journaling this past July. I have used the 'normal' grid look to track and record my pain levels, sleep, etc. I went crazy and decided to jazz up my bujo (gotta love that slang) and started to do some mandala type designs. I ordered a wonderful template that helps create that circle tracker look you see on a lot of bujo's. It's a flat compass and protractor by Moxiedori on Etsy. I love that it fits in the back of my Leuchttrum 1917. This way it is with me no matter where the bullet journal mood strikes. On this spread I wanted to stipple inside the Moon Tracker portion. I'm still such an art nerd. You can take the art teacher out of the classroom, but you can't take the art out of the teacher! Learning to do affirmations is still a work in progress but thanks to The Miracle Morning I really have been able to clarify them. Now being a chronic pain warrior I know I need to do affirmations. This was my first attempt. I didn't really get HOW to do affirmations. One of my favorite bullet journal bloggers suggested The Miracle Morning by Hal Elrod and in it he explains how to create your own affirmations and how to make them work on a daily basis. Even if you don't have the mental capacity (I'm looking at you brain fog) to focus on making your own. Hal Elrod has some great ones on his website that you can start with. I love his Health and Energy one and have been using that affirmation all of January. I really do recommend his book The Miracle Morning. I will do a separate post on how it helped me to deal with my chronic pain later in January.